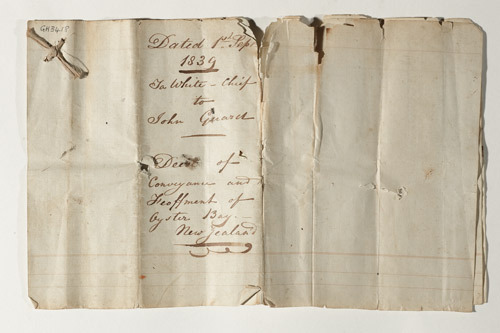 This deed is for one of a number of land purchases whaler Jacky Guard made from Māori in the Marlborough Sounds. It probably covered lands at Kākāpō Bay in Port Underwood, where Guard’s whaling operation was based at the time. There were many such purchases at this time, in anticipation of private land transactions being embargoed when New Zealand became a British colony – which happened the following year. Guard’s title was not recognised by the land commissioners appointed after 1840 to investigate pre-1840 land transactions.